The Breton band "Pas d nom pas d maison" ("No name No house") is a collective of musicians playing a repertoire of Gypsy songs and music from the Balkanic Peninsula (Bulgaria, Hungary, Romania, Macedonia ...), mixed with their various musical influences and complemented by a lot of energy. 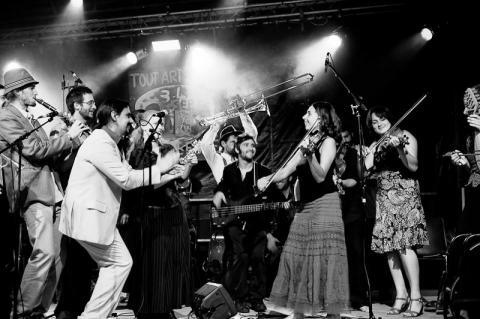 From 7 to 25 musicians, playing songs, upbeat tunes, or ballads for weddings, venues or festivals, each concert is a unique and joyful experience. They are currently releasing their 5th album: TOP56! and planning a tour for the 15th birthday of the band and launch of the album.. ! !